• "Just" is a durational performance which was invited for an exhibition with the theme of Social Justice. 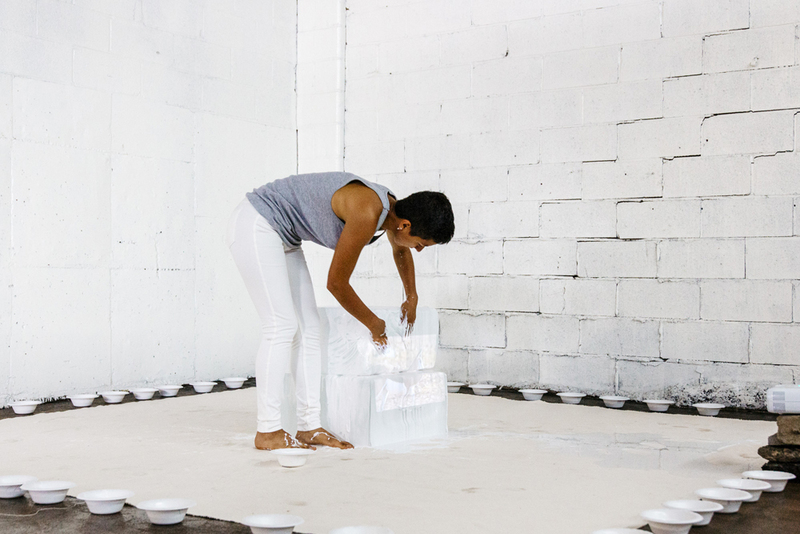 The installation consist of a large size clear ice cube in the middle of a 120" x 120" piece of canvas and 50 bowls of white paint orderly positioned around it. 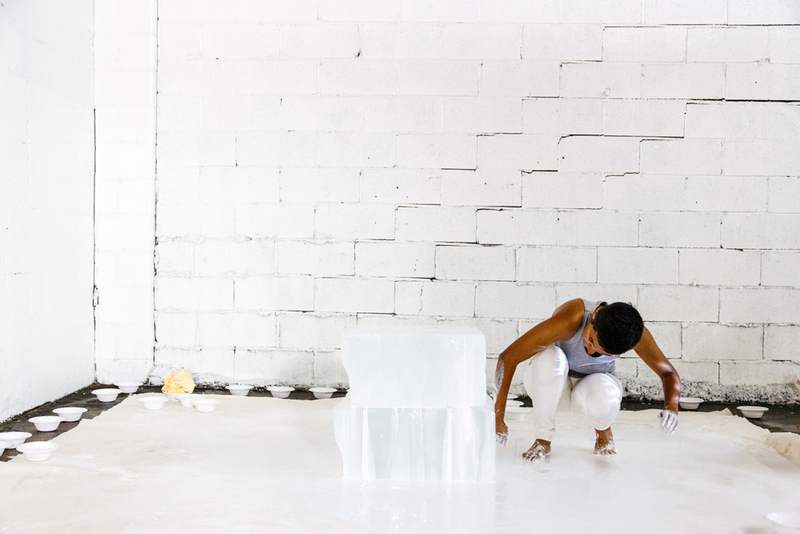 A video, by Maral Satari, is projected through the solid ice which slowly melts into absolute fluidity. The video is looped combined footages of humans and animals in social conditions, juxtaposing their particular behaviors. However the projected video does not show through the ice and it only casts a subtle light on the wall behind it. 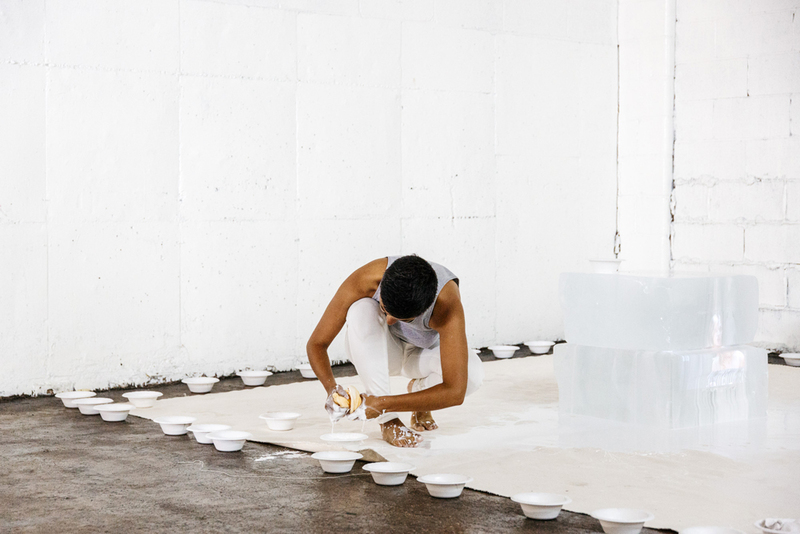 The performance starts by setting the bowls of paint as a border all around the canvas, then every bowl of white paint is poured and rubbed on the surface of the ice cube. The texture of the paint temporarily gives visibility to the video until the water dissolves it. In the meantime, the melted water and white paint is collected with a towel and wrung back out to the empty bowls to prevent water and paint from leaving the canvas area into the gallery space. These acts are repeated for 6 hours until all the bowls are filled up again and the melted water takes over the canvas and the performance.